An intercity road in the interiors of Punjab. Back in Punjab for a few days, I found the highway running parallel to our family home being widened. The changing landscape reminded me once more of the days when the national highway from Delhi to here was not half as wide, and not half as congested. The husband is a great one for vacations, even if in recent years we've been too preoccupied to take a break in the hills. For that is where we always headed, apart from two trips to the Deccan plateau. Green trees outlined on scenic hilltops, the winding roads as we zipped up and down the slopes, the sharp bends and unexpected plain stretches, the clouds above forming a backdrop so mesmerizing that we would miss the chequered foothills and valleys below, all too much to take in at one go ... we carried these memories back from every trip, always made in June. We were fond of hunting out the remotest locations at which to spend our four days. We opted for government-run hotels that offered just enough comforts so that my father-in-law was not inconvenienced. At the same time, we wanted the children to get by with minimal luxury. To their credit, they did, happily. Busy holiday retreats were within motorable distance, yet we avoided the teeming and screaming crowds. We'd coast through the popular sites and stop at the occasional lookouts the road planners had so thoughtfully provided. Parking the car safely out of the way, we'd drink in the scenery which I've always held is unmatched anywhere outside India. On the fifth day, we would hit the road back home. The weather used to be scorching, but I don't recall any of us complaining. The children would nod off to sleep once we were in the plains, as if caressed by the hot breeze streaming in from the rolled-down windows of our Premier Padmini. A primitive stereo player would belt out old Hindi songs that the children still know by heart because of the hundreds of times they were replayed. FM radio came on the national scene many years later. 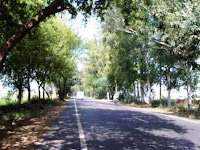 National Highway 1 in those days was a rather narrow strip, flanked by thick foliage that met high above us to form a lush green tunnel through which it was a pleasure to drive. No wonder we did not need an airconditioned car despite our frequent encounters with mirages on the melting road tar. A stretch of National Highway 1. Today the highway has been widened to a six-lane, even eight-lane carriageway, but the trees that lined them have been hacked down for the expansion. The ones planted in an attempt at reafforestation are yet to grow tall enough. Travelling on the state highways brings back those old days, though. 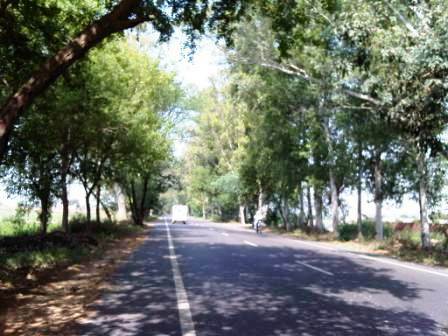 In most of Punjab and Haryana, these are still two-way roads to a large extent, and shaded by trees. Of course, in the not-too-distant future they too could need additional strength to shoulder the growing burden of traffic. A lot of what I write is about 'then and now', but this one's about the transformation of our physical world, of the country we knew and one that is changing track ... trying to get into the fast lane!